Here's an easy way to make money on your blog without much active effort. It's the aLinks WordPress plugin and it's definitely worth a look. The aLinks plugin takes the words and phrases you commonly use on your blog and turns them into links and affiliate links - automatically. The aLinks plugin can create links for many popular affiliate programs and can be expanded to handle all of them. It allows you to use links in your posts instead of banner ads - that no one pays attention to anyway. Just post like you normally do and aLinks will find the keywords and keyphrases and turn them into links. No more having to copy and paste your affiliate codes and URLs. All new keyphrase module system allows for infinitely expandable support for all types of keyphrases. Improved outbound click tracking, with more data and prettier graphs! Import/Export your keyphrases and settings. If your traffic is anything like mine, then a good amount of it comes from Google and other search engine searches. And many times those people will read a post and just move on. They're not interested in blogs or in reading blogs regularly. They just want an answer to their queries. But as a blogger, your goal should always be to bring people "deeper" into your blog. To show them that there's more valuable content for them. How do you do that? With the aLinks Deeper Blog module. The Deeper Blog module will automatically create links in your post to other posts on your blog that have related content. For example, if you define the keyphrase "make money blogging" and use that phrase in a post, aLinks will automatically turn it into a link to your other blog posts that use the term "making money blogging". As you can see, the aLilnks Deeper Blog module can really help you get more readers, more traffic, more page views and more clicks. And that means one thing...more money for you! Looks like a great plugin. I love anything that automates the tedious things we have to do manually day in and day out on our sites. Good call Tom. aLinks is a definitely a good plugin. Problogger wrote even blogged it. 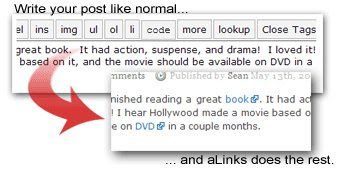 "...Auto links which will automatically link to URLs when you mention certain keywords. This is especially handy if you find yourself mentioning site’s regularly. It also has the ability to turn keywords into Amazon searches (with your associate/affiliate ID) which some will find handy." Good call Tom. aLinks is a definitely a good plugin. Problogger even blogged it a while back. Well said Tom and Anonymous. And that's just it...automation! I've used the plugin on other blogs and I definitely have to say that it's well worth it. What an innovation. Internet marketing continues to amaze me. This is a brilliant concept. Thanks a lot for this introduction. I'd like to see more plugins and innovations like this. The more automation we have, the better. I'll have to check it out. I am a member of Kontera but I can't use it. Whenever I use the Kontera plugin, my site gets so slow it never stops opening the page. It decreases my sites overall speed by at least 75% and I've yet to figure out why. Bobby, I'm assuming that you were using the WordPress plugin for Kontera, is that correct? If so, have you tried using the snippet of code Kontera gives you in your account in the ContentLink Toolbox instead? You just put the code at the bottom of your template right before the closing BODY tag. I've read where the plugin can slow down loading time while Kontera searches for keywords, but I don't know whether or not the code does. I know I haven't seen a difference. So it might be worth a try. Bobby: You're most certainly welcome! Try using the actual Kontera code, as opposed to the Kontera WordPress plugin, and see how it goes. Yeah, too many links can definitely be a bad thing. Luckily, I haven't had that kind of trouble with Kontera. As for aLinks, you essentially define the keywords/keyphrases that show up as links. Basically, which ever ones you assign URLs to would be the ones that are turned into links.